Sometimes we all need to be reminded of fundamentals. The fundamental goal of investing should be to receive the most gain with the least pain. The question then becomes, how do we achieve this? Over the past 100+ years, stocks have provided more than three times the real return of bonds despite the strong bond market of the past 35 years. A much higher long-run return from stocks makes sense, since stocks are riskier than bonds. They should therefore compensate investors with a higher risk premium. The following chart by Wharton professor Jeremy Siegel shows this same dynamic over 200 years from the years 1802 to 2012. Again we see that over the long-run, stocks have earned the highest return by a large margin. The annualized real return of U.S. stocks has been nearly twice as high as the annualized return of bonds since 1802. Even though returns are maximized, the problem with holding only stocks in one's portfolio is their high volatility and negative skewness. These create considerable left tail/drawdown risk. There have been two bear market drawdowns in U.S. stocks greater than 50% during just the past 15 years. Not only can large equity erosions create discomfort and uncertainty in the minds of investors, but they can cause investors to react in ways that are counter to their own best interests. The yearly Dalbar studies show that investors underperformed the funds they were invested in by an average of 4% annually over the past 20 years. Poor timing by investors is often because of emotionally induced buying and selling. To reduce the emotional stress and poor timing decisions triggered by high stock market volatility, investors have traditionally diversified their portfolio into assets other than stocks. The main alternative has been bonds. But as we saw from the above charts, our long-run expected return decreases substantially as we add bonds or assets other to an all stock portfolio. Yet this diminished return has not stopped investors from adopting so-called balanced portfolios, such as the common one that allocates 60% to stocks and 40% to bonds. Even Harry Markowitz, the father of modern portfolio theory, split his personal investments equally between stocks and bonds. Based on financial planning principles, some investors start off with a higher allocation to stocks in their early years and then switch to a greater allocation to bonds as they grow older. This may no longer be as prudent a strategy as it once was. The average life expectancy today when someone reaches the age of 65 is an extra 19 years. This lengthening of retirement years and emphasis then on bond investing can aggravate the problem of portfolio under performance. Investors may need a way to keep growing their investment assets well beyond their retirement age. What exactly does the old paradigm of a balanced stock and bond portfolio mean for wealth accumulation over the long-run? To determine this, I looked at a rolling 40-year window comparing the performance of the S&P 500 to a portfolio invested 60% in the S&P 500 and 40% in10-year U.S. Treasuries from 1900 through 2014. During that time, the average annual total return of the S&P 500 was 10.0%, compared with 8.3% for the 60/40 stock/bond portfolio. Applying these average rates of return to a 40-year investment horizon, a $10,000 initial investment in the S&P 500 would have grown to $537,000 before expenses and taxes, while a $10,000 investment in the 60/40 stock/bond portfolio would have become only $273,500. Due to the power of compounding, an all-stock portfolio would have resulted in almost twice the accumulated wealth of a 60/40 balanced portfolio. In the 1970s, U.S. investors started to look at diversifying their stock holdings internationally, despite the fact that non-U.S. stocks since 1900 have returned on average 2% less per year than U.S. stocks. Jennings and Payne found that fees reduced the benefit of international diversification by one-third for small institutional investors. Fees almost completely eliminated any diversification benefit from investing in emerging market bonds, hedge funds, and private equity. In looking at 45 different asset classes, Jennings and Payne found that fees consumed over half the expected benefit in more than 60% of those markets. Is there anything investors can do to reduce their downside exposure during equity bear markets without giving up half their accumulated wealth in the process? 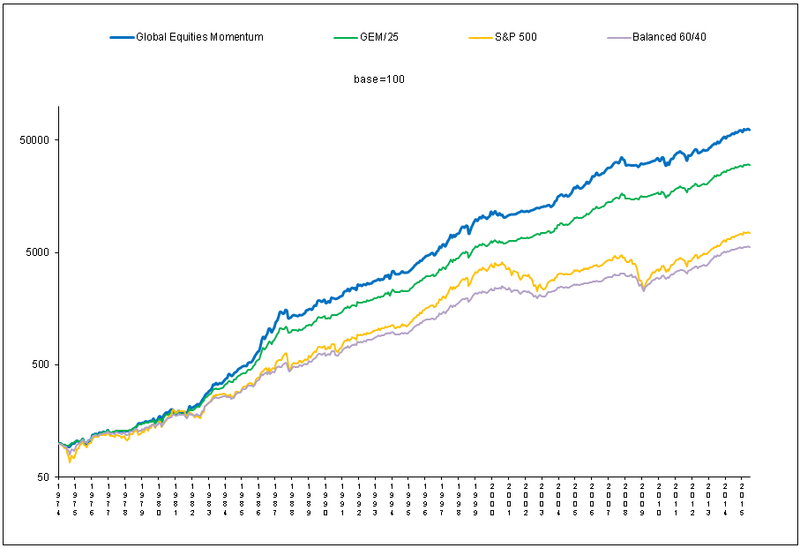 Our dual momentum based Global Equities Momentum (GEM) method diversifies one’s portfolio in a more intelligent way. GEM’s core holding is the S&P 500 in order to capture the highest long-run risk premium. GEM switches between U.S. and international stocks according to relative strength price momentum, which can improve the expected return from holding stocks. 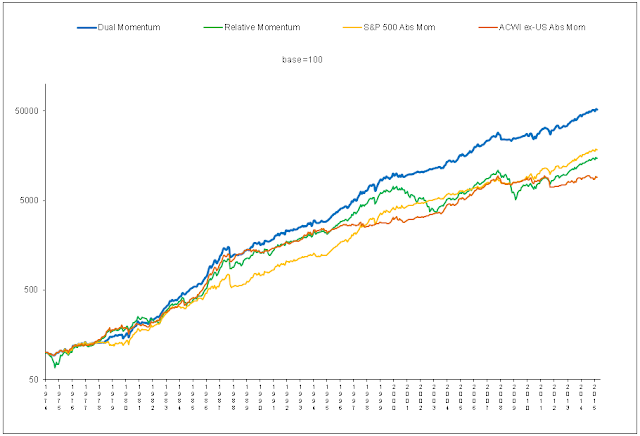 The GEM model also switches between stocks and bonds in accordance with trend-following absolute (time-series) momentum. When equities have been going up according to the rules of absolute momentum, GEM stays fully invested in stocks. When the trend of the stock market turns negative, GEM switches into low-duration aggregate bonds. Bear markets in stocks often foreshadow economic recessions with falling or flat interest rates. These are often the best times to hold bonds. There is also then a flow of funds from stocks to bonds by investors. Dual momentum is an adaptive approach that diversifies in a temporal way, which makes the most sense. Here is the performance of GEM compared with the S&P 500 index and a portfolio allocated 60% to the S&P 500 and 40% to10-year Treasuries from January 1974 through June 2015. Positions are rebalanced monthly. Results are hypothetical, are NOT an indicator of future results, and do NOT represent returns that any investor actually attained. Indexes are unmanaged, do not reflect management or trading fees, and one cannot invest directly in an index. Please see our GEM Performance and Disclaimer pages for more information. GEM has a lower worst drawdown than the 60/40 stock and bond portfolio. Besdies providing greater downside protection than afforded by the 60/40 portfolio, GEM returns have been substantially higher than the returns of the S&P 500 portfolio. Large losses in the S&P 500 need to be recouped before stocks can again show a net profit. For example, it takes a 100% gain to get back to even after a 50% loss. By sidestepping severe bear market losses, GEM can earn higher overall profits. GEM remains in stocks when the trend of the stock market is positive to capture all it can of the high risk premium associated with stocks. GEM retreats to the safety of bonds during the 30% of the time when stocks are weak and bonds are often their strongest. Why would anyone want to adopt a permanent stock/bond portfolio with its fixed income drag on performance when a simple dual momentum approach like GEM has shown less downside exposure and higher expected return than either an all-stock or a balanced stock/bond portfolio? The first reason for some is that the future may not be like the past. 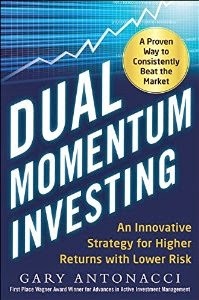 But dual momentum is a simple model with several hundred years of out-of-sample performance to support it. The GEM look back parameter used by Cowles and Jones in 1937, has held up well back to the early 19th century and up to the present time. There are also good reasons, as described in my book, why the momentum effect should continue to persist. The next concern may be occasional re-entry lags when a new bull market begins after dual momentum has protected your portfolio from the preceding bear market. There may also be occasional whipsaw trades at other times that can cause dual momentum to lag behind the stock market. Over the past 40 years, GEM underperformed the stock market in 1979-80 and 2009-10. No strategy can outperform all the time. Career risk associated with tracking error, long-standing aversion to market timing, and confirmation bias may keep institutional investors from ever using dual momentum. As an encouraging note for the rest of us, this attitude should help keep momentum from being over exploited. Since bonds make up 20% of GEM's profits, there may be some concern that bonds may not perform as well in the future as they have over the past. GEM uses aggregate bonds with around only a 5.3 year average duration, which gives them low sensitivity to interest rate changes. GEM uses bonds when there are bear markets in stocks. These often precede recessions which often lead to falling rather than rising interest rates. Finally, the trend-following component of GEM is slow moving to minimize whipsaws. This means that GEM is still subject to the volatility associated with short-term stock market fluctuations. Conservative investors can always allocate a modest portion of their portfolio permanently to bonds so as to reduce this volatility. Here is what would have happened if we had allocated 75% of our investment portfolio to GEM and 25% permanently to aggregate bonds from January 1974 through June 2015. The GEM/25 allocation now has the same volatility as the 60/40 portfolio, but GEM/25 has a substantially higher annual return and Sharpe ratio. The maximum drawdown of GEM/25 is only 39% as large as the maximum drawdown of the 60/40 portfolio. We see that dual momentum in various forms meets our fundamental goal of investing – the most gain with the least pain. Both portfolios had the same 40-year minimum average return of 5.4%. On the basis of avoiding the lowest average portfolio return, the 60/40 portfolio was not any better than the S&P 500 portfolio over a 40-year time frame. The GEM model is disclosed in my book, Dual Momentum Investing. It takes only 1 or 2 minutes per month to apply it. Even those who understand and appreciate momentum can be subject to long-standing biases that keep them from using momentum in a significant way.